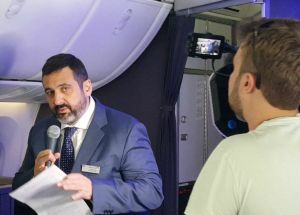 Alex Cruz has been chairman and chief executive of British Airways since April 2016. He is a Spaniard and long-time London resident whose university education was spent in the United States. Alex began his professional career at American Airlines in 1995 and in 2005 he founded Click as a low-cost airline, amalgamating with Vueling in 2009 with a reverse takeover. We slightly paraphrase his speech to the London Aviation Club on Wednesday 6 December 2017 and include the question and answer session afterwards. These embrace an enquiry by John Hutchinson, ex-BA Concorde pilot, relating to the airline’s (mainline) controversial removal of short-haul complimentary cabin service. Unheard-of at the Aviation Club it gained an audible response from the gathering. Readers should refer to BTN 18 December 2017 to make up their own minds. “It’s been five years since I’ve had the chance to speak to you here with my previous hat on in 2012. Clearly the context of global aviation has changed. Then, we were paying $111 per barrel of oil, we had no low-cost long-haul businesses and the major American airlines were just beginning to reap the benefits of Chapter 11 and consolidation. Barack Obama was just about to be re-elected for the second time and the conflict in Syria was only just beginning. And yet, while I reflect on some of the messages I shared with you five years ago, it is clear many other things have not changed. European short-haul competition has intensified, leading to some consolidation, the unfortunate demise of Monarch and airberlin, and the likely transformation of Alitalia. We also continue to face an unreasonable tax burden, which unnecessarily restricts the true ability of our economies to develop, and of course we continue to be an industry which is required to become more efficient every single day. I can’t resist mentioning that I did predict that easyJet would be providing feeder services for our carriers. Now, let me say a bit more about those three things. I spoke about the intensity of competition in the short-haul market. Whether you’re sitting in Vueling’s office in Barcelona or BA’s office in Waterside, the intensity is hot. I dare say you will have different views about the success about European legacy airlines in facing up to competition in short-haul, and you will have different views about how British Airways has taken on this challenge, so let me make our position very clear. We are, we have always been, and we will always be, a premium airline. And we are and always will be committed to customer choice. Given some of the players in the marketplace, we don’t really make an apology for making ourselves more efficient in various ways, so we can consistently compete effectively. If you look at our fares to Rome when we were flying 30 years ago, the price in today’s money was about £400. Today, you can get return tickets for about £80. Low fares are popular, and for many of our customers they are what they expect, but they don’t happen by magic. They happen because airlines get themselves in the right shape to be able to offer them. So, I’m very pleased when we offer hundreds of thousands of seats from London for £30 or less, which we have done this autumn, but I’m equally pleased many customers seem happy about that as well. There has been quite a focus on our short-haul product throughout the course of this year, so maybe it’s worthwhile to tell you about what differentiates us in that market – for example, our airports. We fly from London’s most convenient airports and we have by far and away one of the best networks from London’s most central airports, even City, where we fly to convenient airports at your destination as well. We have a fantastic loyalty programme, which has won many awards and offers great benefits, including lounge use, seat selection priorities, baggage priorities – all those things you’re so familiar with. We have our leading Avios scheme, which gives you points for flying or shopping, which you can spend on future flights, either with us or with our partners. We have the best punctuality record on departures from London. We must say this over and over, particularly when we compare to the other carriers in London. We are the only UK operator to offer customers a choice of cabin on short-haul flights, and this year we restored the premium cabin on our UK domestic services. We are the only airline to have partnered with a leading British brand, Marks and Spencers, to supply the onboard catering. On many of our routes, we have the biggest schedule and therefore offer more choice. Where severe weather disrupts flights, we give you more journey options. We’re there. We are nervous if you’re not at your destination. We will put you on another plane, we will put you on our partners planes – we will get you there as quickly as we can. That is a huge differentiating point with the other operators. And of course, we have our brilliant flight crew and cabin crew. They have an unrivalled bank of experience and expertise which they put to work every single day. Forgive me for listing so many distinctive attributes British Airways offers – I know many of you are completely familiar with them, but sometimes they can easily be overlooked. Here, in 2012, I also mentioned tax. I was concerned about a new tax on Spanish airport users. Now, I’m concerned about what is becoming a tax that continues to weigh down potential economic contribution of the whole UK aviation industry. Despite its negative impact on wealth creation and jobs, the APD remains with us. It is the highest aviation tax in Europe, and continues to rise. It’s £78 for long-haul economy tickets, and £172 for all other cabins including premium economy from April 2019. It discourages UK consumers and individuals from interacting with the world, and the world from visiting the UK. As the country prepares for life after Brexit, this tax will make less sense than ever. And I stressed the importance of efficiency in all things. We are certainly very conscious of that at British Airways. We benefit from economies of scale and the synergies available to us as part of the IAG Group. We are reducing our legacy aircraft, we are continually reviewing our processes and the way we do things. As many of you know, we’re currently discussing our future pension arrangements with our colleagues and trade unions. As someone pointed out, about half of this room should be on current or future pension benefits. Naturally we don’t just pursue efficiency for its narrow sake – we do it to strengthen our business, to enable us to take on the competition, to create financial headway and invest more money in customers. Five years’ ago, I was in a fundamentally different job. Since then, I’ve moved back to a very iconic airline, British Airways. The ten years of my working career at American were perhaps just a small taster of what I was to find when I joined BA from Vueling. The differences are stark. Size, strength of the brand, complexity, the appreciation of BA’s heritage, and frankly, BA’s values. These values are special – they’re timeless. Our essential Britishness, our history of innovation, our expertise, our professionalism, and our personalised service that puts quality and reliability first. As an adopted Londoner who has lived here for more than 20 years, I know well the place British Airways holds in the affections of this country and right around the world. I often share with my colleagues and others how I felt when I started working for BA. I found a group of around 45,000 professionals who were extremely passionate about the company they worked for – and I thought I was the king of culture after starting an airline from scratch! – but BA staff live and breathe British Airways every single day. Secondly, I found a tremendous amount of experience. EASA rulebooks have been partly written by my new colleagues. Deep knowledge on extremely technical topics in engineering – tremendous breadth and depth on everything related to safety and security. And yes, pilots, and cabin crew, and airport staff who have been there, done it, lived to make BA great over the years. Huge passion and huge experience. I also found some intensifying challenges at British Airways as a business. Yes, my predecessors (including a certain Irishman that I am still working for), had all achieved an incredible list of structural changes, which fundamentally places BA today at the top of its league against peers across all measures, underlined by a very solid balance sheet. Thanks to that work, today I can focus on building a British Airways that can make it through all the competitive headlines, old and new, short-haul and long-haul, as well as many other types of pressures. For the first time, we’re facing challenges that don’t have to do exclusively with the airline industry. The digital revolution is here. It’s not just about journalists – it’s happening, and it is going to have an effect on our industry – full-on, every day. There are many angles to it and I’d like to share with you a couple that are taking up a lot of our time and, increasingly, our budget. Customer expectations and digital disruptors. The customer expectation is really rather easy. Have any of you had problems with Uber, Amazon, Deliveroo, or any of these new service providers? They’re incredible in how they recover from any problems they might have. They’re fast and generous and they leave us with the sensation that they really will do everything in their power to fix whatever problem we’re having and make sure it never happens again. They’re educating you and me as consumers in terms of what to expect when dealing with brands. Consumers are getting more and more demanding in terms of what they expect as service. It is essential to interact with our customers quickly, accurately, consistently and in line with their expectations. If not, consumers will go to competitors – and those competitors might not be in our industry. With disruptors, you get people saying “Don’t you know where my bag is? Because I know,” or “Why are you telling me the delay is 15 minutes when I know it’s actually 37 minutes?” We find ourselves in situations today where customers know more and more about us, and maybe more than us. More and more start-ups are coming up with applications that inch into our operating models, providing an attractive proposition to our customers. We should also be aware of the in-roads the big players are making in terms of artificial intelligence, machine language and analytics. In fact, it’s probably happening right now. Your mobile phones are probably buzzing with messages from all of these guys telling you what to do and what not to do. At British Airways, we’re working very hard on our response, and we’ll have more to say over the course of the next year. Now, we are focusing on modernising our airline from the inside to the outside. Because of the changes we’re making, we were able to announce a £4.5 billion investment plan last month, which will see us take delivery of 72 aircraft over the next five years, including important new types of aircraft for BA. And if I were to just look at our plans for 2018 – what could you expect from us? Well, we will be welcoming a team of new aircraft, including our first A320 and A321NEOs, with their significantly improved environmental performance. We’ll also be operating our biggest ever route network at British Airways, with new long-haul services launching to the Seychelles from Heathrow, and to Toronto and Las Vegas from Gatwick. We’ll also continue to expand our short-haul network, and in total we’ll be flying 39 more routes in 2018. That’s without including the discussion on our new slots in Gatwick. I look forward to working with the team to choose the destinations that we’ll fly to. We’ll come back to you as soon as possible and let you know when they’ll be put up for sale. We’re also growing our new leisure services from the regions which we introduced this year. From May 2018, there will be extra weekend flights from Manchester, Birmingham and Bristol. Our transformation of Club World continues with our very well-received catering and bedding changes, which are starting to roll out beyond our New York JFK services. We launched Newark yesterday, Boston follows on Friday and San Francisco and San Jose next week. From January you will see these products spread right across our long-haul network. You will also see significant upgrades to catering for our economy customers in the World Traveller cabin. We will also completely re-design the lounges in JFK for Club and First, as well as in Rome and Aberdeen. The vast majority of our global fleet will be equipped with wi-fi by the end of this year and we will have installed 72 more self-service bag drops at Heathrow for those that want to use them. We continue to try and make our customer’s journey through the airport as smooth as possible. That’s just 2018. Over the next few years we have many more plans that will further cement our position as a premium airline committed to customer choice. I would like to end by reminding you that BA is coming up to a very special anniversary – our centenary – in 2019: 100 years. This is a very fantastic, inspiring and motivating anniversary, and opportunity. 2019 looks like a special year in terms of certain activities. Now I’m not going to add to the vast amount of commentary on this issue, as I’m sure you’ve heard it all and more. My simple message is very clear: We’re going to be there. Regardless of what Brexit brings for us, BA is going to continue flying across the globe, linking the UK economy to the world, supporting imports and exports and continuing to hire thousands of people every year. Our best days lie ahead”. Oliver Clark from FlightGlobal: You’re going to be shutting OpenSkies and replacing it with LEVEL in Paris. Could you explain why that business failed? Also, you have other all-business products from London City, are you reviewing those? Alex Cruz: I had witnessed the operation of OpenSkies as a business from a distance for many, many years. I had no idea how it was performing. When I came in, we had a good look at OpenSkies and at IAG, who were creating LEVEL, and it was a match made in heaven, to be quite honest. We had the opportunity to leverage the presence of some fantastic staff we have in France, an AOC in France, and that could support IAG’s LEVEL, which has become a fantastic product. That’s how we ended up there. The Airbus A318 all-business service from City to New York has undergone a tiny bit of transformation, changing from two daily flights to one, and the plan at the moment is to continue that. It’s performing well. With new aircraft coming to the marketplace I think we need to consider where the future may be, but at this moment we’re going to continue the service as is. John Hutchinson, ex-BA Concorde pilot: You rather skipped over the issue of Buying on Board, which I think has been a complete disaster for British Airways, so how are you going to modify this? Alex Cruz: I’m not going to modify it. It is a product which is now standard across Europe. The very large majority of seats flown in Europe have buy on board. There are two airlines left to adopt buy on board and I’m absolutely convinced they will adopt that product in the coming months. That’s not the issue. The issue is how can British Airways deliver the product significantly better than everyone else. We’re competing with people who’ve had that product for the last 20-30 years – we’ve managed to get it up and running in less than a year. Yes, it was difficult at the beginning. To be honest, the demand for the product completely surprised us. We had planned for the similar levels of adoption to what our sister carriers have had and national airlines of their own, in their own countries. I think the focus of the team is to allow people to have the food you want when you’re flying at a reasonable price, significantly higher choice and significantly higher quality. Yes, we will evolve with the model. There are all sorts of things we will offer as part of the future generations of buy on board. It was absolutely the correct decision for BA to take and I absolutely admit it was very difficult in the beginning. It was the logistics issue we had to deal with – it took us a number of months to get it to work – we’ve made apologies for that and we’ve fixed it, but in terms of the model, that’s not what defines an airline. What defines as airline is when a flight is cancelled. When a flight gets cancelled and an airline tells you ‘I’m going to take care of you – I’ll give you two choices. Here is your money back, or here’s the next available seat five days from now’ – that’s not how we work. If we cancel your flight we’re going to be there with you every step of the way. We’re going to get you on the next available flight, through our partners, through our airports, and through that experience we’re going to look after you the was British Airways has always done. Over all the years you worked at BA, that spirit hasn’t died. We’re providing lots of tools to our staff to do that and making lots of investments as well. We’re introducing lots of different technology, iPads, different ways of working. We offer all those forms of support. So, no, I don’t think the future of BA is going to be defined by buy on board, that is just a fact. It won’t go away. Every carrier in the world will be offering food for people to buy on short flights as we do. The trick is to deliver in the best way possible. Dan Lewis, Institute of Directors: What price is too high in terms of landing charges for you to support Heathrow expansion – when you’ll consider moving to another airport? Alex Cruz: That’s a very long-winded question. I think it’s absolutely clear that we believe in Heathrow’s expansion, but we don’t believe in Heathrow’s expansion at any cost. We want to do this in a way that it doesn’t have a toll on today’s passengers and passenger infrastructure, so we must get to a pricing and a cost scheme that will work for everyone. BA is in a fantastic position to contribute to the UK economy if it was given 10%, 20%, 30% - whether it will be additional capacity. We’re ready to fly to a bunch of new places around the world from Heathrow, so we’re very keen to keep expanding from there with a new runway. It has to be done for the right price. We cannot just allow any buildings to be made at any cost under any circumstances with any effect on passengers that can be built at any time. I’m very impressed by the discussions which have already been occurring between Heathrow Airport and the Government, etc. and I think we’re going in the right direction. Paul Connellan, AVIAT Consulting Ltd: The decision was taken before you took over to effectively withdraw BA from everywhere outside London. You’ve got the connecting services and the odd leisure flight, but given the growth of the economy outside the South-East of the UK and the fact that BA has lost dramatic market-share to other carriers in places like Manchester, Birmingham, Newcastle, Edinburgh – do you think it’s time to revisit that decision? Alex Cruz: I think the decisions my predecessors have made with regards to strategies in the regions were probably very sound, given the platforms they had to operate on, so please let’s not make a mistake. The seats are there and then some. There’s considerably more regional traffic, both domestic, into Europe and other places, than there has ever been in UK history. Does BA have a role in that? Time will tell. Are we taking some small baby steps to understand what those markets are buying? Yes. I was making some comments about the flying we could do next summer using our CityFlyer team from London City Airport. So, the whole subject continues to be of interest. At the moment, we are committed to exploring this market in the same way that we’ve committed to summer flying over the coming years. Having said that, it’s an incredibly competitive market, so if you think about who’s operating the majority of the seats in the regions, we’d need to be ready to compete on a very, very low-cost basis. Mr Cruz\'s comments on how BA would bust a gut to help you if your flight was delayed by bad weather sounded very hollow indeed to several thousand BA customers just 72 hours after he had delivered it when Heathrow was hit by light snow. The editor of US airline business magazine Air Transport World (for which I am a correspondent) blogged about it here: http://atwonline.com/blog/british-airways-heathrow-uk-border-force-mess-big-time Her flight was actually delayed by her BA aircraft\'s APU apparently expiring, but the level of passenger assistance was similarly abysmal.